SITE NAVIGATION: Click the Product Name or Picture below to reach the item's web page. Once there, click on the Price to reach the Order Page or order directly by clicking on the PayPal button. Please read DISCLAIMER before ordering. For credit card orders, call us at 828.628.7093 EST All prices include USPS Priority shipping in the USA unless otherwise noted. and yes...We ship USPS internationally! International customers will be notified of shipping costs after purchase or before upon e-mail request. Pirates' Price $435.US Silver (USPS Priority Included in US) (1) Flawed Kit In Stock at Discount Price! 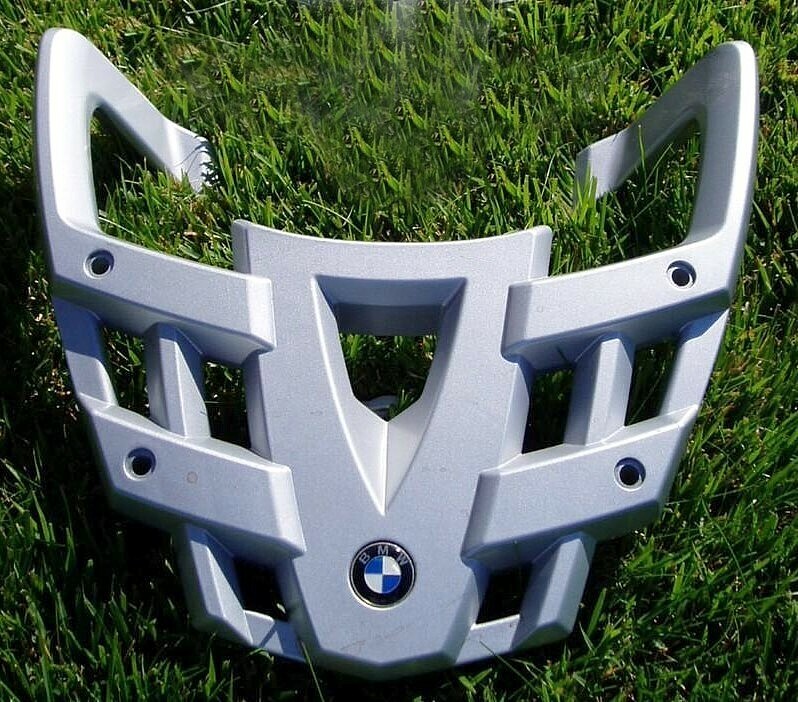 BMW R1200GS 2004-2012 Stealth Backrest A Pirate's Lair Exclusive! The R1200GS Stealth bracket bolts to the factory rack in under 3 minutes and allows for easy on/off backrest use.The stainless steel Stealth bracket (with stainless steel hardware) is impervious to virtually everything nature can throw at it.. and actually strengthens your plastic factory rack. The best part.. it will look factory.. perfectly mimicking the angular lines of the bike. Backrest material is a dead-on match for the black factory seat. The best part...the backrest slides off in 15 seconds with the furnished quick-release knob! No mods necessary. . Our backrest will NOT fit the Adventure unless the standard GS rack is installed. Semi-soft luggage is available. Fits 2004- mid 2013 BMW R1200GS. For Customer Comments.. Click Here Manufactured in the USA by Pirates' Lair. Note: In the middle of the 2013 model year, BMW changed rear racks. Our backrest fits the early production R1200GS's thru mid-2013 with this rack.. it does NOT fit the late 2013 model with this rack. 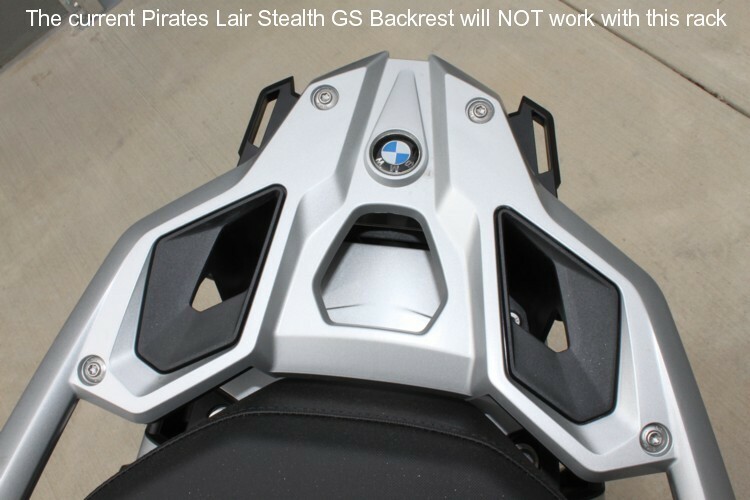 BMW R1250RS / R1200RS Stealth Backrest A Pirate's Lair Exclusive! The R1250RS / R1200RS Stealth backrest will be a thing of beauty, simplicity, and comfort and.. a worthy addition to the Pirates' Lair line of specialty motorcycle backrests. Our kit will include a padded backrest and an aluminum mounting plate that bolts directly to the top of your oem rack. Install is under 10 minutes with standard tools. The backrest's polished stainless steel slide bar slides on and off the bike in under 15 seconds. No modifications necessary. Just bolt it on and give your passenger piece of mind. Our first class upholstery is done by world renowned custom seat and backrest maker, Sargent Cycle Products. Available in a rich textured black powder coating. Semi-soft luggage is available. Manufactured in the USA for Pirates' Lair. Pirates' Price $425.US Black (USPS Priority Included in US) Coming Summer 2019! EMail Us If Interested..
BMW K1200RS/ K1200GT Stealth Backrest A Pirates Lair Exclusive! Considering taking out a second mortgage to buy that Corbin seat just to have a backrest for your BMW K1200RS or GT? Fagetaboutit! Our black Stealth bracket bolts underneath your system case hardware and allows for easy on/off backrest use.The lightweight aluminum bracket (with stainless steel hardware) is almost completely invisible when on the bike. The backrest slides off in 15 seconds! No mods necessary. We also have a GT version which utilizes the same bracket system, but with GT exclusive fabric. Thousands sold! Semi-soft luggage is available. Fits all model years K1200RS 97-2004 KRS2 & 2002-04 K1200GT.. Customer Comments Click Here Manufactured in the USA by Pirates' Lair. BMW R1150R Stealth Backrest A Pirates Lair Exclusive! Our black R1150R Stealth bracket bolts underneath your rear oem rack and allows for easy on/off backrest use. The stainless steel bracket (with stainless steel hardware) is almost completely invisible when on the bike. The backrest slides off in 15 seconds! No mods necessary. The fabric on our cover matches the oem seat perfectly and will look factory. Semi-soft luggage is available. Fits all model years BMW R1150R As this backrest has been discontinued we are always looking for used kits on the open market. When we find them we refurbish when necessary and sell here. Cash, MO, or check only.... Customer Comments Click Here Manufactured in the USA by Pirates' Lair. Honda ST1300 Stealth Backrest A Pirate's Lair Exclusive! After over a year of research and development, the ST Stealth Backrest has turned out to be a thing of beauty, simplicity, and comfort and.. a worthy addition to the Pirates' Lair line of specialty motorcycle products. Our stainless steel stealth bracket with it's patented design bolts directly to the factory luggage rack in under 10 minutes with standard tools and remains almost invisible while on the bike. The backrest's polished stainless steel slide bar slides on and off the bike in under 15 seconds. No modifications necessary. Just bolt it on and give your passenger ....piece of mind. Our first class upholstery is done by world renowned custom seat and backrest maker ...Sargent Cycle Products. Each Stealth bracket is covered with Tuff Stuff Rhino Lining® which is a textured rubber-like SPRAY coating that is impervious to just about everything. Semi-soft luggage is available. Fit's all model years including the 2015! For Customer Comments.. Click Here Manufactured in the USA by Pirates' Lair. Kawasaki Concours 1400 Stealth Backrest A Pirate's Lair Exclusive! Our Concours 14 Stealth Backrest has turned out to be a thing of beauty, simplicity, and comfort and.. a worthy addition to the Pirates' Lair line of specialty motorcycle backrests. Our kit includes a padded backrest, which offers two positions fore and aft, and an all new aluminum luggage rack which replaces the plastic rack. Install is under 5 minutes with standard tools. The backrest's polished stainless steel slide bar slides on and off the bike in under 15 seconds. No modifications necessary. Just bolt it on and give your passenger ....piece of mind. Our first class upholstery is done by world renowned custom seat and backrest maker ...Sargent Cycle Products. The furnished aluminum bracket is covered with a rich, textured black powder coating. Semi-soft luggage is available. Fit's all model years including the 2019! Manufactured in the USA for Pirates' Lair. Kawasaki Versys 1000 Stealth Backrest A Pirate's Lair Exclusive! Our Versys 1000 Stealth Backrest is similar to our Concours 1000 version. A thing of beauty, simplicity, and comfort and.. a worthy addition to the Pirates' Lair line of specialty motorcycle backrests. Our kit includes a padded backrest an all new aluminum luggage rack which is larger than the crappy little plastic oem rack which it replaces. Install is under 10 minutes with standard tools. The backrest's polished stainless steel slide bar slides on and off the bike in under 15 seconds. No modifications necessary. Just bolt it on and give your passenger ....piece of mind. Our first class upholstery is done by world renowned custom seat and backrest maker ...Sargent Cycle Products. The furnished aluminum bracket is covered with a rich, textured black powder coating. Semi-soft luggage is available. Fit's the 2015+ Versys 1000! Manufactured in the USA for Pirates' Lair. Suzuki VStrom 1000 / 650 Stealth Backrest A Pirate's Lair Exclusive! The Suzuki VStrom Stealth bracket bolts directly to the factory rack in under 3 minutes and allows for easy on/off backrest use.The stainless steel Stealth bracket (with stainless steel hardware) is covered with a rubberized Rhino coating which is impervious to virtually everything nature can throw at it. The best part.. it will not muck up the lines of your beautiful bike. Our VStrom Stealth perfectly mimics the angular lines of the bike. Backrest material is a dead-on match for the black factory seat. The backrest slides off in 15 seconds with the furnished quick-release knob. No mods necessary. Semi-soft luggage is available. Sound to good to be true? Fits the 2002-2012 VStrom 1000 and the 2004-2011 VStrom 650 only.. For Customer Comments.. Click Here Manufactured in the USA by Pirates' Lair. Yamaha FJR1300 Stealth Backrest A Pirate's Lair Exclusive! The FJR1300 Stealth bracket bolts directly to the factory rack in under 3 minutes and allows for easy on/off backrest use.The stainless steel Stealth bracket (with stainless steel hardware) is covered with a rubberized Rhino coating which is impervious to virtually everything nature can throw at it and will not scratch your factory rack. The best part.. it will not muck up the lines of your beautiful bike. Our FJR Stealth perfectly mimics the angular lines of the bike. Backrest material is a dead-on match for the black factory seat. The backrest slides off in 15 seconds with the furnished quick-release knob. No mods necessary. Semi-soft luggage is available. Sound to good to be true? Fits the 2006-2019 FJR1300 Only. For Customer Comments.. Click Here Manufactured in the USA by Pirates' Lair. Roll Bag by T-Bags Pirates Lair offers 2 choices of accessory luggage for your Stealth Backrest. The Roll Bag... and the Universal Helmet Bag. Both slide down over the backrest via a tailored sleeve and then lock securely into place with quick release clips. Both offer EASY access and a rigid design so they maintain shape when empty thanks to dual wall construction. Waterproof? Yes, when used with the custom tailored inner rain sleeves that come standard with each bag.. FYI.. the Roll bag is a great around town bag.... For two-up, I suggest the Universal. Pirates' Price $165.US Roll bag (USPS Priority Included in US) Only (1) Left! Discontinued by Manufacturer!